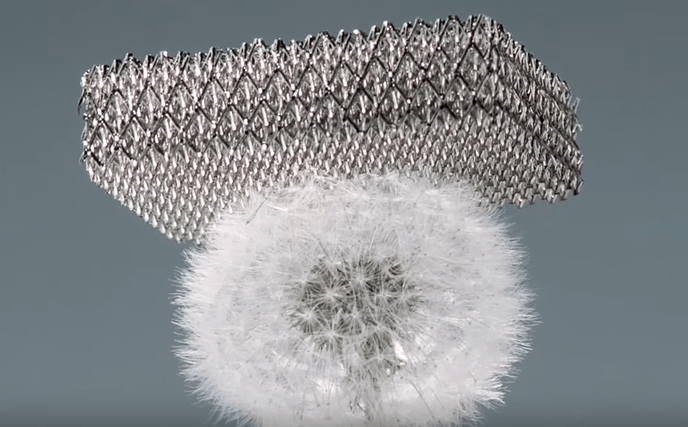 Boeing has released a video highlighting microlattice, what they say is the lightest metal ever made. At 99.99% air, it’s light enough to balance on top of a dandelion, while its structure makes it strong. Strength and record breaking lightness make it a potential metal for future planes and vehicles. Incredibly, it is 100 times lighter than styrofoam, making microlattice one of the strongest materials known to science in general. The most obvious application for the ultra light metal is in aerospace where use of it within a plane would reduce the weight of the aircraft and save an astronomical amount of money on fuel. Research scientist at HRL laboratories, Sophia Yang, says the metal is comparable to bone, whereby the outside of the bone is rigid while the inside is mostly hollow. This results in an open-cellular structure that ultimately lends to microlattice being extremely strong and lightweight at the same time.